We will get there within hours of your call. We will tarp any holes and leaks we find. We will remove any additional debris resting on your roof, even if it requires a crane to get it to the ground. Your insurance company agrees: In most cases, the tarp service call for such an emergency is not subject to the “Deductible” on your policy; that means the Insuror will cover such protection without charging you for any portion of it; we suggest that you check before we begin installing. When it comes to roofing emergency, we are going to provide you the best emergency roofing services in Charlotte. Every year, we are called out for dozens of emergencies just like yours. We can even discuss the options and prospects of typical insurance coverage under the terms of a homeowner policy. Speed is of the essence. Limit the damages and remove the threat to your home. 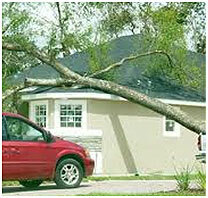 Call as soon as possible after the incident to limit the losses, and let’s get your household back to normal. Don’t wait. A hole in your roof may cause additional and unnecessary damage to the interiors of your home. Your insurance company agrees: In most cases, the tarp service call for such an emergency is not subject to the “Deductible” on your policy; that means the Insuror will cover such protection without charging you for any portion of it; we suggest that you check before we begin installing. Please, check BBB Rating for on of the top Charlotte Roofing Contractors here. We want to be your local Charlotte roofing company, a roofing contractor you can count on… Call today for details and a report on your roof condition. Charlotte’s best roofing contractor will inspect your home within a day or two of your call.